After visiting the recent Sustainable City’s exhibition, and seeing the Giba Organics display, I was inspired to set up a permaculture vege patch in a series of containers, with a helping hand from Mr Wooden Spoon. It doesn’t look like it from the pics, but it was a hella windy day and topsoil, kraal manure and leaves were flying everywhere! Check out our step by step photo-guide at our Flickr group or in the gallery below. i think i’m going to have to try this on the balcony at home. i need fresh salad leaves! fresh and delicious – grow your own! not too deep but the plants don’t need that extra soil, so it might be a waste to fill it up. you could do a layer of stones, branches or bricks at the bottom and then start layering the soil from about halfway up the container. take a picture and send it in. I am interested to see what the box looks like as I’m keen to make some myself! 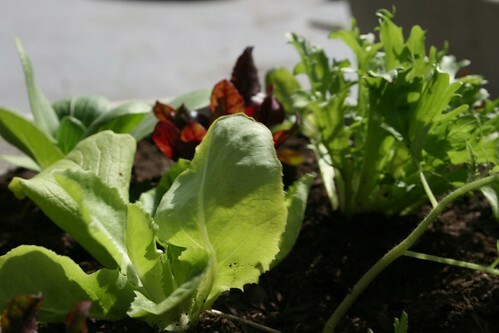 Thanks Niall will send through the pics… the lettuces are coming along like wild fire. I put extra cardboard, dead organic and live organic to make up the space. I did use one full bag of manure and one full bag of top soil.